A document obtained by the Inlander through a public records request raises questions over the city of Spokane’s claim that it’s legally obligated to make a controversial $318,000 payment to hotel magnate Walt Worthy to cover the cost of environmental clean up at a property now occupied by the Davenport Grand Hotel. Earlier this month, members of Spokane City Council expressed concerns that the payment negotiated between Mayor David Condon and Worthy violated the Washington state constitution’s prohibition on gifting public funds to private individuals and businesses. The Condon administration has justified the payment, arguing that because the city had previously owned the property it could legally be held liable for environmental contamination. Paying for the cleanup, according to the argument, would relieve the city of liability. But the agreement that transferred the property from the city to the Public Facilities District undermines that justification. The agreement, negotiated in 2003, states that the district, which later sold the property to Worthy in 2013, is responsible for any legally required environmental clean up on the 120,000-square-foot property. Stuckart says he has not seen a complete legal analysis of the issue from the City Attorney’s Office. The council’s policy advisor is currently examining the legality of the payment to Worthy, he says. People who show up to speak at city council's open forum can and will continue to use a derogatory name for a part of town long plagued by prostitution. The council passed an ordinance that prepares the city for a statewide phaseout of medical marijuana dispensaries. A new task force will look into why the city employs fewer women and pays them less and what can be done about it. Two weeks ago, civic gadfly George McGrath was rebuked by Council President Ben Stuckart for referring to a pedestrian bridge connecting the University District to East Sprague as the “bridge to Hookerville” during the council’s public comment period. McGrath refrained from using the offending phrase last week. But last night, he twice uttered “bridge to Hookerville” during the public comment period, drawing no response from Stuckart. As the public comment period continued, one man complained to the council about management at the East Central Community Center before continuously repeating “bridge to Hookerville” 31 times before being cut off by Stuckart after Councilman Mike Allen called a point of order. Allen said that while he had defended people's right to use the phrase, the man had probably taken it too far. “I respect your right to do that, but at the same time you could express your position without having to do it that way,” said Allen, who then requested clarification from Stuckart on if the phrase could be used. 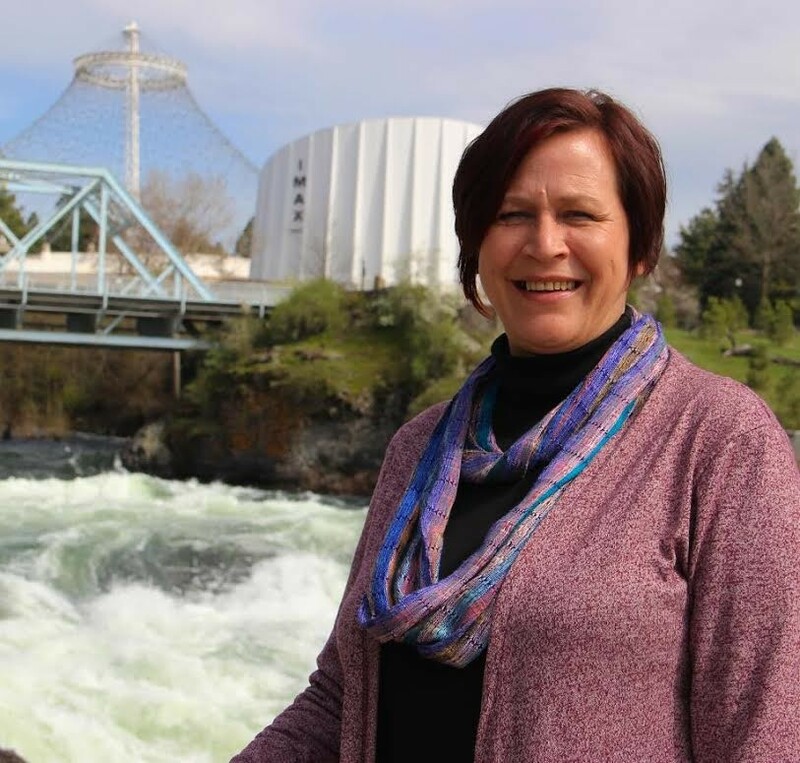 Clean water advocate the Spokane Riverkeeper has joined a coalition of other environmental groups suing the Obama administration over what they say are inadequate safeguards on potentially explosive oil trains. On May 14, Spokane Riverkeeper joined ForestEthics, Sierra Club, Waterkeeper Alliance, Washington Environmental Council, Friends of the Columbia Gorge and the Center for Biological Diversity in filing a lawsuit against the Obama administration in the 9th Circuit Court of Appeals over its new oil train safety standards. Earlier this month, the U.S. Department of Transportation put in place a new set of standards intended to make the increasing number of oil trains traversing the country (including Spokane) less likely to derail and explode. The standards include enhanced braking on trains, reduced operating speeds and retrofits of existing tank cars. Shortly after being announced, the new standards drew criticism from Washington Sen. Maria Cantwell. According to the lawsuit, the new rules were written “arbitrarily, capriciously, and contrary to law.” The rules, according to the lawsuit, have an “unduly long” 10-year phase-out period for DOT-111s and CPC-1232s, tank cars that critics say are unsafe for transporting oil. The lawsuit also faults the new rules for giving local jurisdictions inadequate notification and having a less protective standard for retrofitted tank cars. 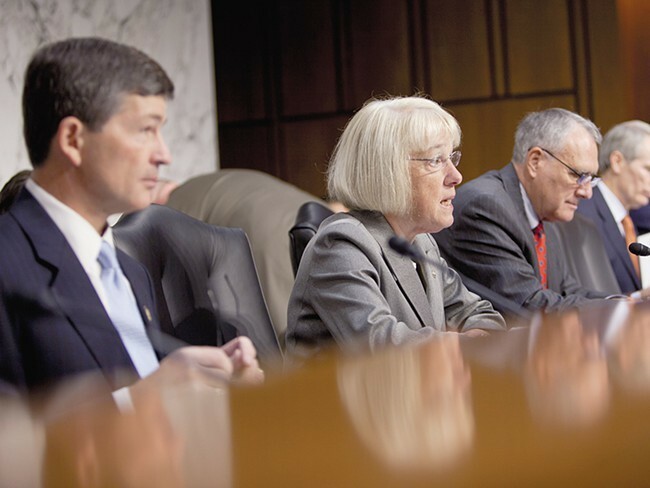 Last week, we published a story about how Washington Democratic Sen. Patty Murray, despite her far-left ideology, has managed to become a unique force of compromise and deal-making in Congress. 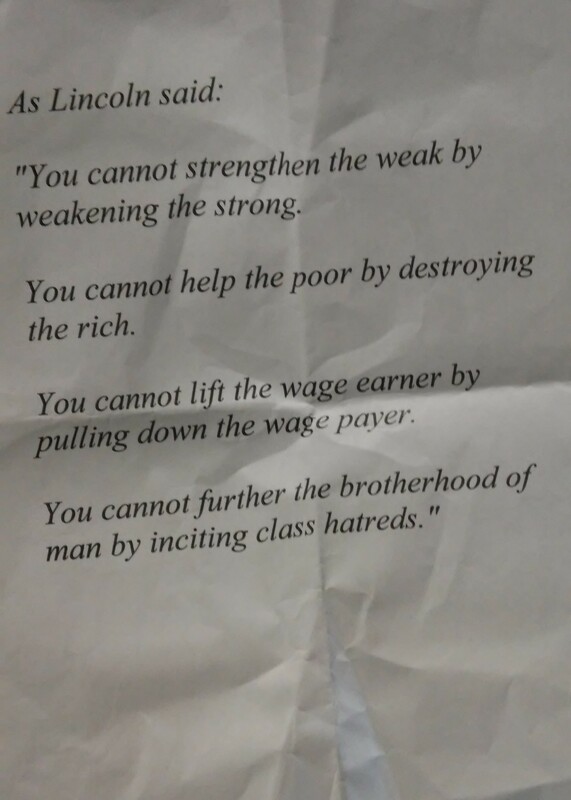 Here are a few additional selections from the interview. They got so stuck in a philosophical debate in their own turf, that they put us — if you will recall — into a government shutdown, sequestration taking place, people across the country wondering if we could even do anything in this country, wondering whether our democracy worked. Two businesses who were finding their international partners were not trusting our country to be able to do what we needed to do to manage a country. That dynamic created the opportunity to work with Congressman Paul Ryan. Two very different people, two very different budgets, two very different philosophies. We challenged each other together, to look at each other not as foes, but as collaborators in trying to put together a budget. And that’s how we got that done. We had been talking, long before we’d ever got put into a room, to get to know each other. Who you are, what brings you here, what’s important to you? Knowing what’s important to somebody creates the groundwork to be able to listen to someone and trust them. We got government running again. We got our economy moving again. We got the votes in the House and the Senate. And, by the way, don’t [shut down the government] again. Spokane City Council President Ben Stuckart has drawn his first declared challenger in John Ahern, a former Republican state representative. 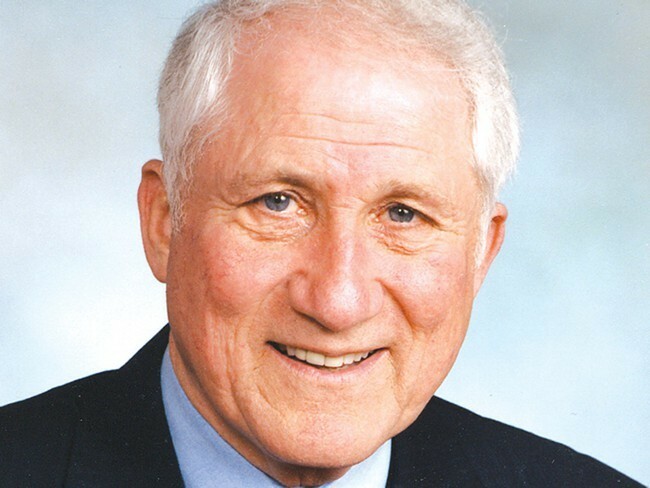 Ahern, 80, had filed to run for the seat being vacated by Councilman Mike Allen, but he’s changing course and will file paperwork on Monday to challenge Stuckart, who is seeking a second term as head of the city’s legislative body. He tells the Inlander that it made more sense to challenge Stuckart rather than risk splitting the conservative vote with LaVerne Biel for Allen’s seat. If elected, Ahern says he’ll focus on improving the business climate in Spokane, which he says is causing some companies to relocate to Spokane Valley or Idaho. He also says he’ll place a moratorium on the sale and production of marijuana. Additionally, Ahern will reverse the city’s so-called “Sanctuary City” ordinance, which prohibits city employee from inquiring about people’s immigration status, saying that it invites terrorists and foreign criminal elements into the city. “The city council needs adult supervision and parental guidance,” says Ahern, who made an unsuccessful bid in 2013 for the council seat currently held by Councilman Jon Snyder. Envision Spokane held the kickoff for its Workers Bill of Rights initiative petition, drawing a handful of supporters that included Shar Lichty, the only declared challenger to Mayor David Condon. Supporters have until July to collect about 2,500 signatures to get the initiative on the November ballot. If passed, most employers would be required to pay their workers a “living wage” that will be calculated by the city. 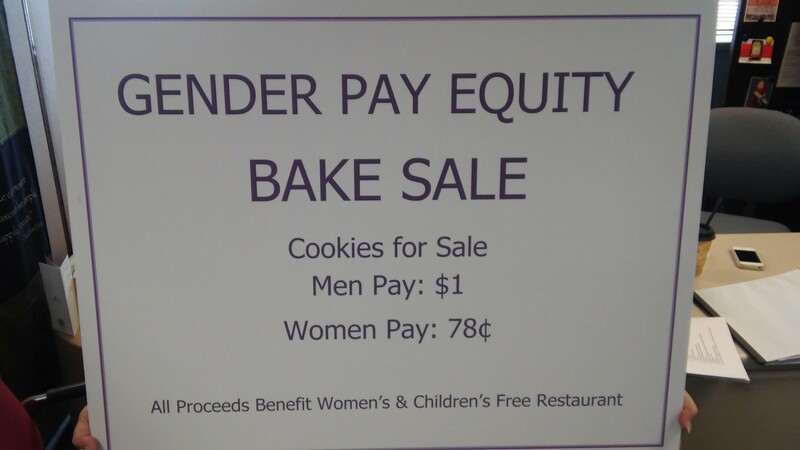 It would also bar employers from firing workers without a “just cause” and require them to pay employees equally regardless of gender, gender identity, race, ethnicity, familial status, religion and other categories. Lichty, who works as an organizer for the Spokane Peace and Justice Action League, made an appearance at the event held Wednesday night at the Community Building downtown to show her support. Lichty said she supports the initiative because it was crafted in a way to minimize its impact on on small businesses while raising wages. She said there would be no coordination between the campaigns. If you ever wonder if medical marijuana (more specifically, medical marijuana for soldiers suffering from post-traumatic stress disorder or brain injuries) can be bipartisan, just look to Washington state Rep. Matt Shea, R-Spokane Valley. 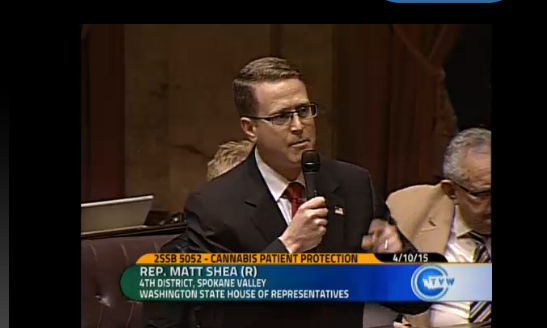 State Rep. Matt Shea speaking out for the right of veterans to some medicinal weed. edical marijuana patients to register with the state. In the same speech, he mentioned that medical marijuana could help returning soldiers struggling with PTSD. “Addressing that issue in the right way with medical marijuana, in some cases, dramatically reduces suicide rates,” he said, citing research showing that the substance can reduce deaths among veterans. PTSD and traumatic brain injuries are now qualifying conditions for medical marijuana under a marijuana reform bill that passed the Washington State Legislature. However, Congress isn’t as eager to get returning soldiers some weed. Last week, the U.S. House of Representatives narrowly voted down an amendment to an appropriations bill that would allow Department of Veterans Affairs hospitals to discuss medical marijuana with patients, reports The Hill. "Why in the world would we give a drug that is addictive, that is prohibited under Schedule I, that is not accepted for any specific mental disease or disorder and enhances psychosis and schizophrenia, why are we going to give that to our veterans, especially those with PTSD? That is just absolutely insane," said Rep. John Fleming, R-La., a physician, according to the paper. Medical marijuana supporters were predictably bummed. “While it’s disappointing that the House just voted to continue a senseless rules that prevents doctors from treating military veterans with a medicine proven to work for a number of serious conditions, the fact that we came so close is a good sign of things to come,” said Tom Angell, chairman of the Marijuana Majority in a prepared statement. That’s from a fake news article. D.A.R.E. thought it was a real article. Some members of Congress think that the disturbances in Baltimore have something to do with the drug war. Tesla, the maker of upscale electric cars, has developed a futuristic battery that can be used in the home. It’ll also be great to grow weed with. A woman in Missouri is arguing that a “right to farm” enshrined in the state constitution extends to her marijuana crop. Colorado Gov. John Hickenlooper, who opposed legalization of pot in marijuana, is now saying it’s not such a big deal after all. People will no longer be allowed to utter the word “Hookerville” at Spokane City Council meetings. The city’s legislative body appointed members of task force that will help craft an upcoming earned-sick-safe-leave ordinance, which will include an opponent of the entire idea. And a regulatory framework for short-term rentals, such as Airbnb, was approved. George McGrath, civic gadfly, said "Hookerville" for the last time in front of City Council on Monday. During city council’s open forum period, when anyone gets three minutes to tell Spokane’s lawmakers almost anything they want, George McGrath, who regularly shows up to berate the council, was ordered to stop using the word “Hookerville” to refer to East Sprague Avenue, a part of town that has struggled with prostitution. In the past, McGrath has referred to a pedestrian bridge that will link Washington State University Spokane to East Sprague Avenue as the “bridge to Hookerville.” But last night, two members of city council weren’t having it. “So my First Amendment rights are gone because I'm at the meeting of the Spokane City Council and some people don't like the terms I use?” said McGrath. “Your three minutes are up,” replied Stuckart. “Yes they are,” scoffed McGrath. One of two competing bills that would bring more regulation to the growing number of trains hauling crude oil through Washington state has been has been approved by both chambers of the legislature. Although it’s the legislation supported by Gov. Jay Inslee and local elected leaders in Spokane, it underwent some modifications that one advocacy groups says makes it less effective. In recent years, Washington has seen a surge in trains carrying oil from the Bakken Shale in North Dakota to refineries and terminals in the western part of the state. Oil trains have derailed and exploded in Illinois, West Virginia and Quebec, raising concerns that the same could happen in Spokane. Trains carrying crude oil pass through Spokane regularly. In response, elected officials in Spokane have supported legislation that would give first responders more information on trains passing through their jurisdiction, while also placing more financial liability on rail companies if one did derail. 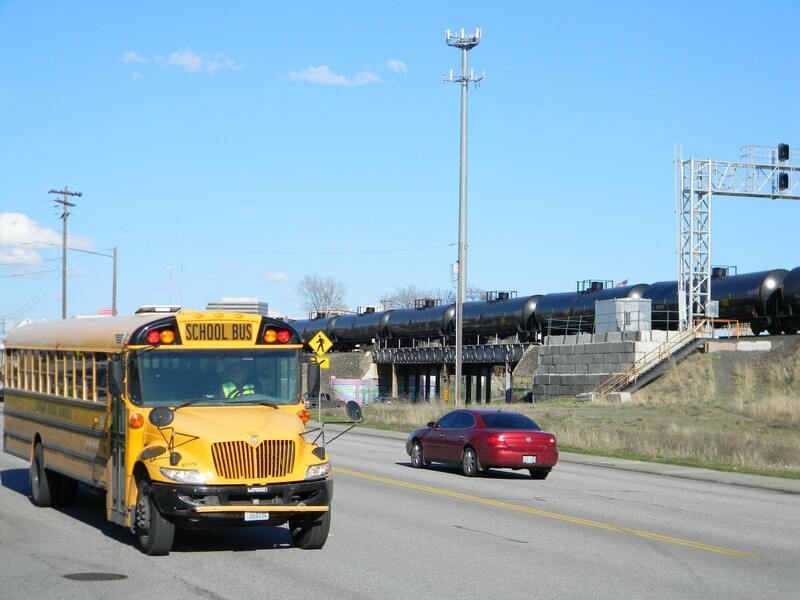 During this session, two bills aimed at the oil train issue were introduced. One bill, SB 5057, passed by the Republican-controlled Senate and would have required rail companies to provide local jurisdictions with information on trains that passed through their jurisdiction for the previous week and to increase the crew on the trains. That bill ultimately failed to make it through both chambers. The other, HB 1449, made it through the legislature to the governor's desk last week.